I took a half-day off work Friday, May 11, so I could drive to Columbus for dinner. I had toyed around with the idea for a day or two, and was still waffling about it Thursday night, and then Jenn pointed out that if I went, and it was awkward and no fun, I’d forget about it soon enough, but if I didn’t go at all, I would undoubtedly wish I had. Big surprise: My wife was totally right. 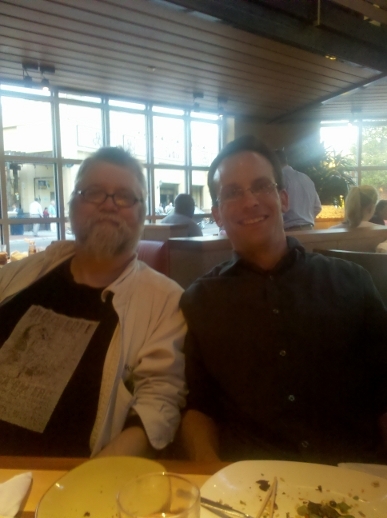 I’ve been a fan of Jay Lake‘s writing for a few years now, and while we exchanged a few emails around the time I was reading The Specific Gravity of Grief, I had never met him at a convention or spoken with him. And though I have thought it would be kind of cool to visit Portland for “JayCon, ” his annual open-invite birthday party, that hasn’t been a viable option of late. So when he announced on his blog that he’d be in Columbus for a brief business trip and would be at the Northstar Cafe at Easton for an open dinner, I figured, Why Not? Good food too: I had a tasty turkey sandwich and a surprisingly unique rice salad, and then we all shared a gigantic, gooey, eyeball-vibratingly good chocolate-chocolate-chip cookie. Everyone was easygoing and fun to be around, and I felt really comfortable from the moment I sat down. The sun was just setting when I headed back north on the interstate, incredibly glad that I’d made the drive.